WARNING: This message is only for Dialysis Patients and or the people who love them, who dare to dream of being free themselves, or of seeing their loved ones freed from the necessity of being tied to a machine 3 or more days a week just so they can live a life of repeated painful access surgeries, toxic sickening pharmaceuticals that create side effects that are more severe than the conditions they are supposedly designed to treat, and an overall poor quality of life with absolutely no hope of regaining an acceptable level of health-ever! You go to bed tonight after hours of dialysis treatment earlier, and you dread the thought of this perpetual exercise for the rest of your natural life. And you are adamantly opposed to having another human being’s organ, (most likely from a dead person), in your body. You go to bed with all of this dread haunting you. Then you awake in the morning only to find that you were trapped inside of nightmare all the long, and that it was all only a very bad dream. And now, you have your life, health, strength and your freedom back. There are no more machines, access surgeries, toxic pharmaceuticals, doctors, dieticians, social workers, dialysis techs, nephrologists or extended hospital stays due to your illness. Now of course as the last paragraph above comes to an end, so does the warm and fuzzy feelings that this dream of a cure creates. Now you are back to the dark reality of being cursed with Kidney Failure and being a prisoner to the Dialysis Industry because you need a (certain amount), of their products and services to stay alive. Waking up from this lifelong nightmare once and for all is what this website is all about. Will you have a lot of company in your quest to be cured? But if you dare to dream of a cure and combine your energy and efforts with others who dare to dream of a cure, you have a better chance of waking up from this nightmare than if you just continue to allow yourself to be destroyed day by day, treatment by treatment, pill by pill and body part by body part. If you don't like what you see, feel or are experiencing at the hands of this Greedy Corporate Entity, please do your part to alert the "Powers That Be" to the fact that there is a problem with this industry, and how it treats its Cattle, (Patients). 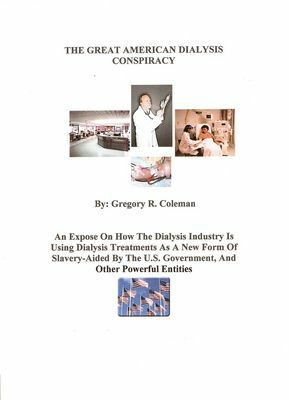 If you are a dialysis patient, you are part of one of the most profitable rackets in the U.S. Only thing is, you don't profit or benefit.....They do!